Phenom was spayed about a month ago, so thought I would pass along some things that helped us during her spay procedure and recovery phase. First, I spoke with the vet beforehand about some concerns I had. 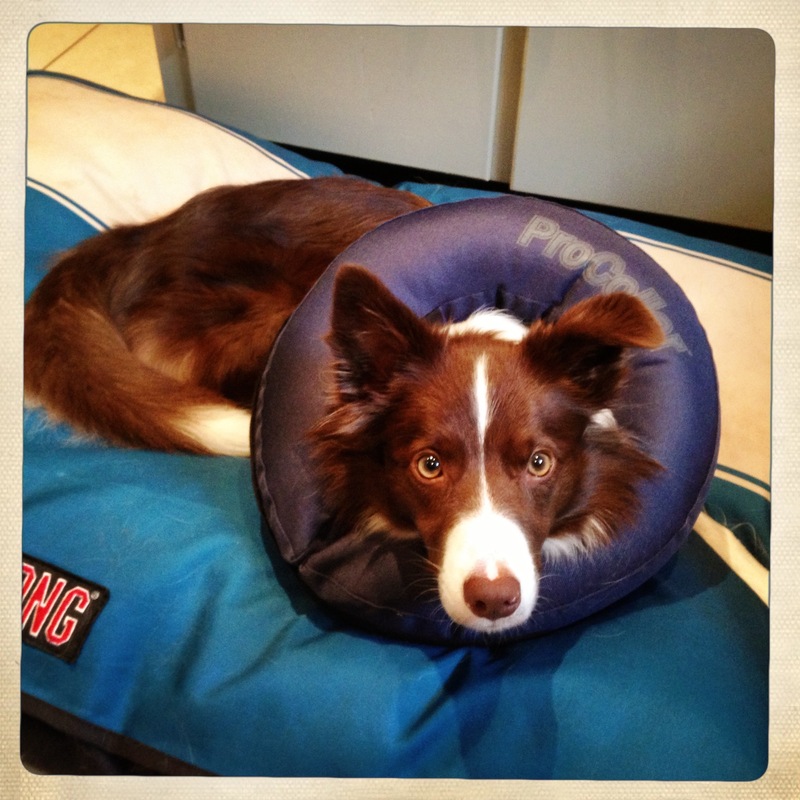 Oftentimes border collies – especially particularly athletic ones – can have a really low heart rate during surgery. So – it’s something I wanted to make sure they were aware of and also talk through which meds they were using. Just a little proactive peace of mind. We had a great experience with Atrium Animal Hospital. They were super attentive to Phenom. They let me take her back to put her in the crate when I left her, and that made me feel better. Crate training is so important for her stay at the vet being a less stressful one and for her recovery at home too. When I went to pick her up they gave me very detailed recovery instructions. Sometimes I wish doctors would take a cue from vets with the really nice detailed written instructions. Since she was a puppy – I had actually worked with her on accepting the “cone of shame,” (aka the Elizabethan collar) but the way she would whip that thing around – I feared for many of my belongings – my safety and not to mention the safety of Piper and Vega. So . . . I got some good advice from a friend who suggested the Pro Collar inflatable collar. That was much better. I have to say though – I had to make sure to fit it really snug and inflate it all the way – because a couple of times she got her foot stuck in the opening. But after I inflated it more and tried to make sure the opening was behind her neck – that became less of an issue. And it was much more comfortable for her. Her activity was restricted for 14 days, so I knew I had to be prepared to keep her busy. I got lots of new bones for her to chew on – I prefer Nylabones because they don’t splinter. I also froze several stuffed Kongs which she loved. There are a lot of recipes out there, but this is an easy one I used. I just mixed that up, put it into a kong and popped that in the freezer. Then she had a nice treat that took her some time and energy to enjoy. We worked on some calm games that didn’t require much movement. Here we are working on her just tapping her nose on the ball to roll it back to me. Even with this, she was getting excited, so then I had her lay on her side and tap the ball. Just something fun to keep her mind busy and have a little fun. We also worked on naming objects. That’s a hard one. We’re still working on that. Have you heard about Chaser the border collie that knows 1,022 nouns? Pretty awesome to know that’s possible. Here a video of her showing some of her skills. And here’s another video demonstrating her understanding of nouns and verbs. Well – we have a long way to go – but definitely something to work toward. Behavior, training (and hard work) is so fascinating to me. After 14 days of restricted activity, I think Phenom was about to explode by the end, but she was a trooper. And she was so glad to get back to running, jumping and playing. And me too. Hey – it’s what we do.